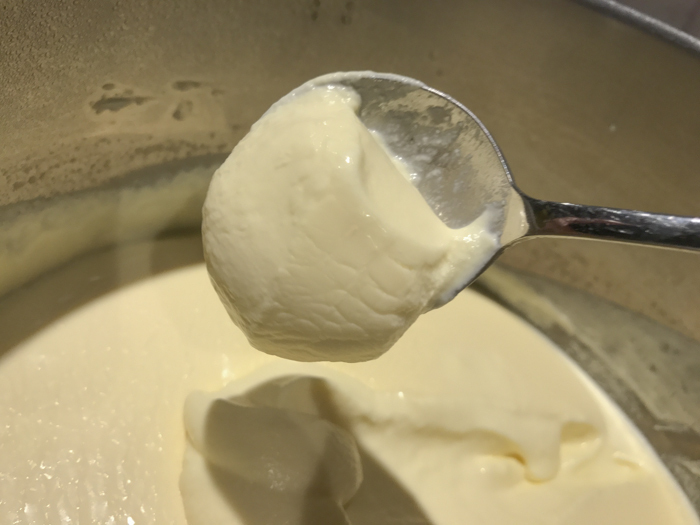 Creme Fraiche is a cultured cream product with high butterfat and a wonderfully mild, tangy flavor. It is thick and rich, so it is often used like sour cream. It provides a delicious topping for soups, main dishes and especially desserts. So, forget the whipped cream this fall and make Crème Fraiche to garnish fresh fruit from your fall harvest. This recipe is perfect for beginners because it is so easy to make. 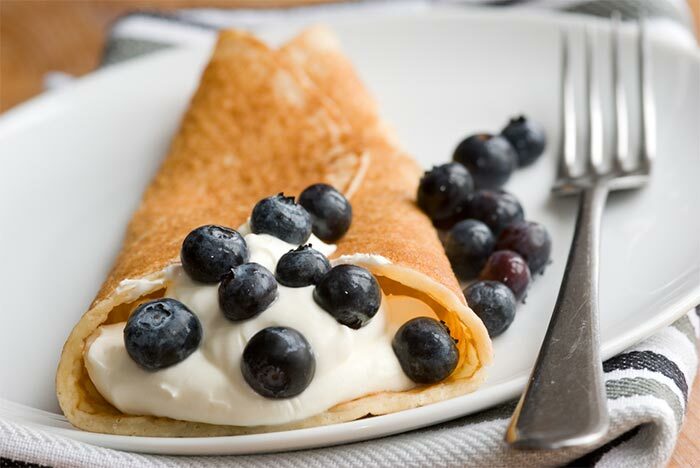 With a little cream and culture, you can enjoy homemade Crème Fraiche in your own kitchen. 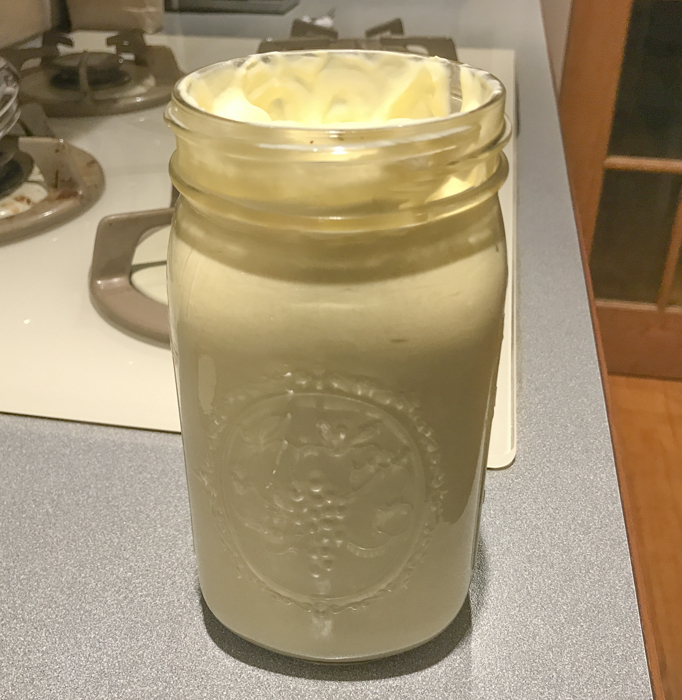 Any type of raw or pasteurized dairy cream can be used with this recipe, although it's best to avoid ultra-pasteurized dairy cream due to unpredictable results (sometimes it works, sometimes it doesn't). 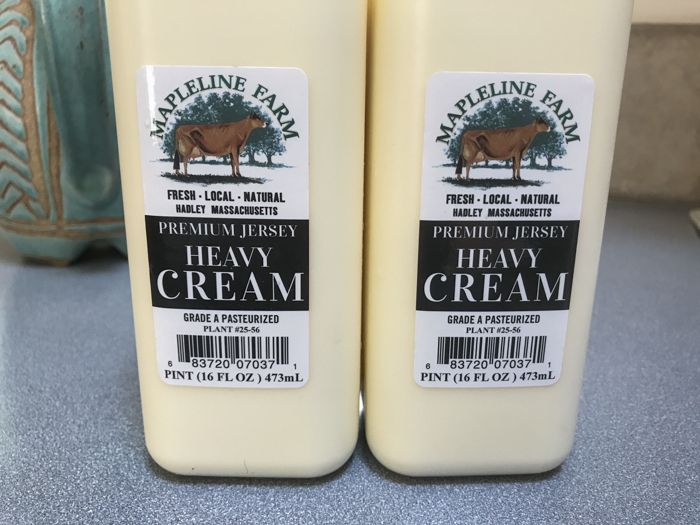 Heavy/whipping cream, light cream, and half & half, each produce slightly different results. Raw cream can be used, however, it may yield thinner Crme Frache. 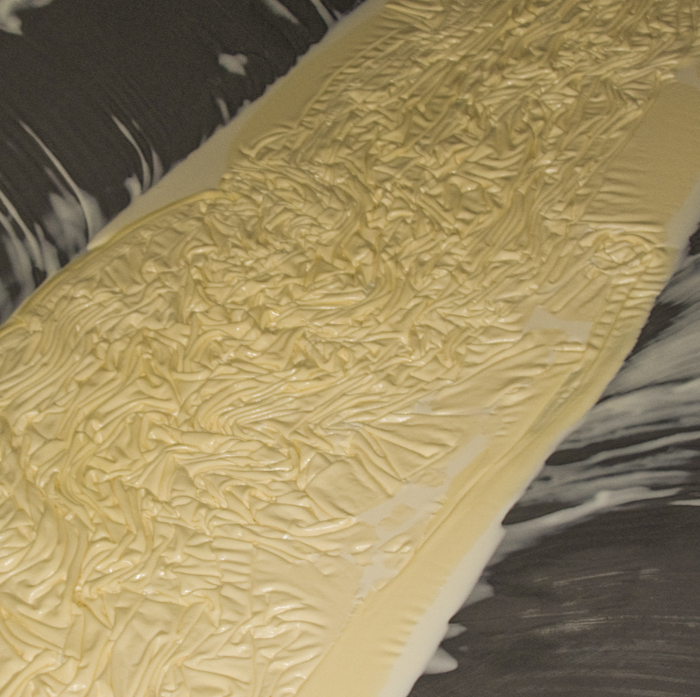 This is because certain proteins within the cream are not activated before the heat from pasteurization. My experience has shown pasteurized heavy (whipping) cream works best. C33 Crme Frache culture contains a small amount of rennet to firm the final cream. If a slightly firmer texture is desired, you can use C20G Chevre culture which contains slightly more rennet. If you would like a thinner texture (runnier), try using 1/8 tsp of Aroma B or Flora Danica culture without any rennet. 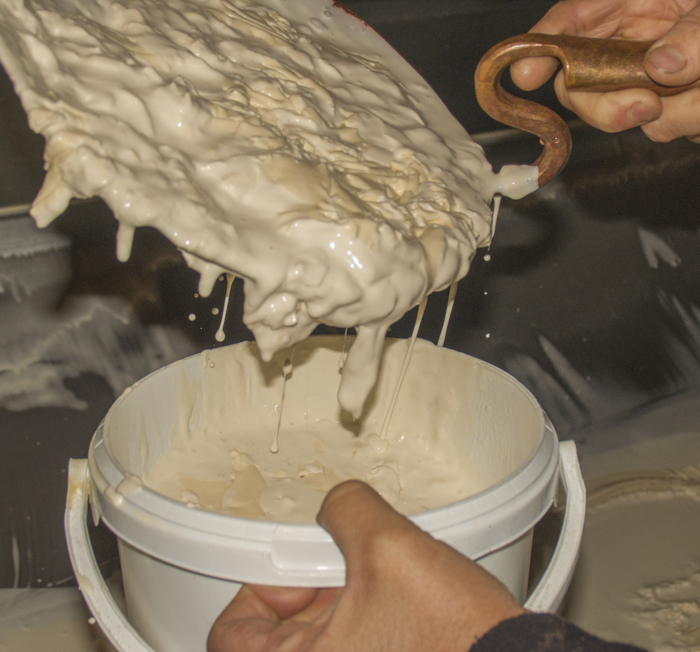 Traditionally, no rennet was used while making Crme Frache on the farm. If you would like a firmer cream using Aroma B or Flora Danica culture, add 1-2 drops of single strength rennet per quart of cream. 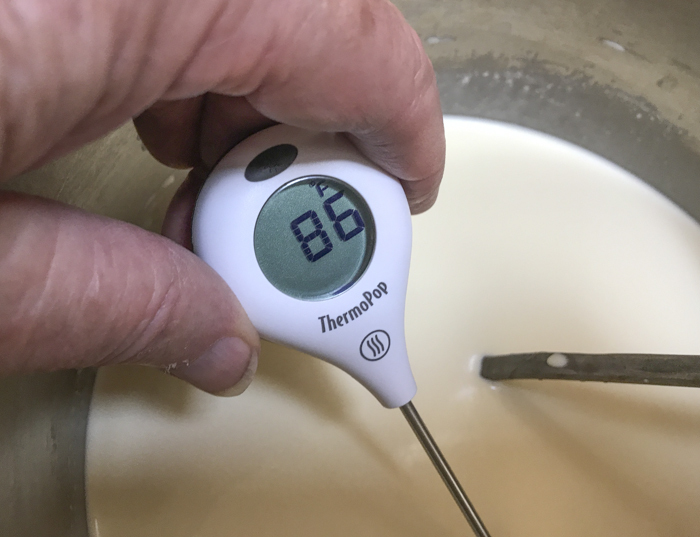 Once the cream is at 86F, the pot can be removed from the stove and the culture can be added. To prevent the powder from caking and sinking in clumps, sprinkle the powder over the surface of the cream and then allow about 2 minutes for the powder to re-hydrate before stirring it in. Let the cultured cream sit quietly for the next 8-12 hours to allow the culture to begin doing its work. If the room temperature is below 72F, wrap the pot with a towel to help keep the cream warm. The change in acidity, caused by culture converting lactose to lactic acid, is what transforms the cream. This is the reason why Crme Frache keeps longer than fresh cream. 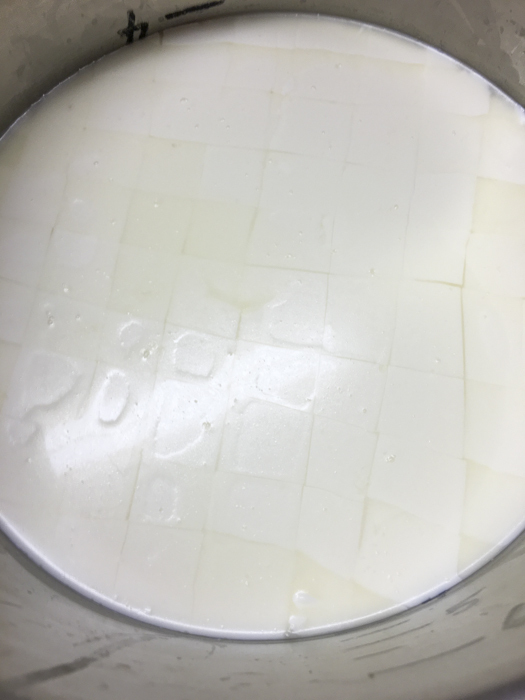 After about 8 hours examine the curd texture for firmness. This can be runny to slightly firm, depending on your desired texture. Also, taste the curd for the desired amount of acidity. The sweeter it tastes the looser the texture will be. This is because the acid development changes the texture. When it's ready, it should begin to show a release from the pan when tilted, as shown in the photo aboe. If you allow it to become too acid, it will be similuar to sour cream. When it's ready, simply transfer the Crme Frache into an airtight container, preferably glass (I like to use wide mouth canning jars). Store Crme Frache in the fridge for up to 14 days. The texture will thicken substantially when chilled so you may want to anticipate this when examining the final texture in the pan. As the summer draws to a close, the orchards and gardens are showing their best rewards. The fall harvest of fruits and garden goodies call for a celebration in the form of apple, peach, and pumpkin pies, as well as soups and other goodies made from the garden. Around here that means Creme Fraiche. Forget the whipped cream, and make some Crème Fraîche to really delight the folks at the table. You will be amazed at how simple it is to do. 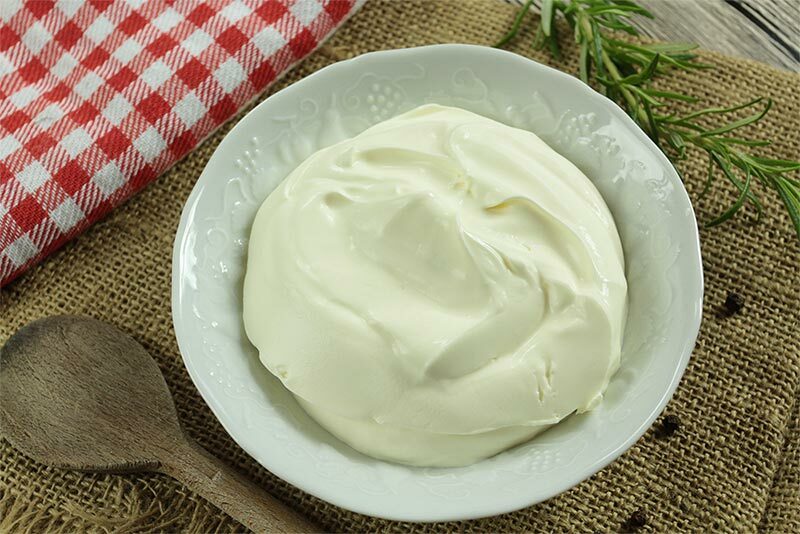 Crème Fraîche is a cultured cream product with higher butterfat and a wonderful mild tangy flavor. 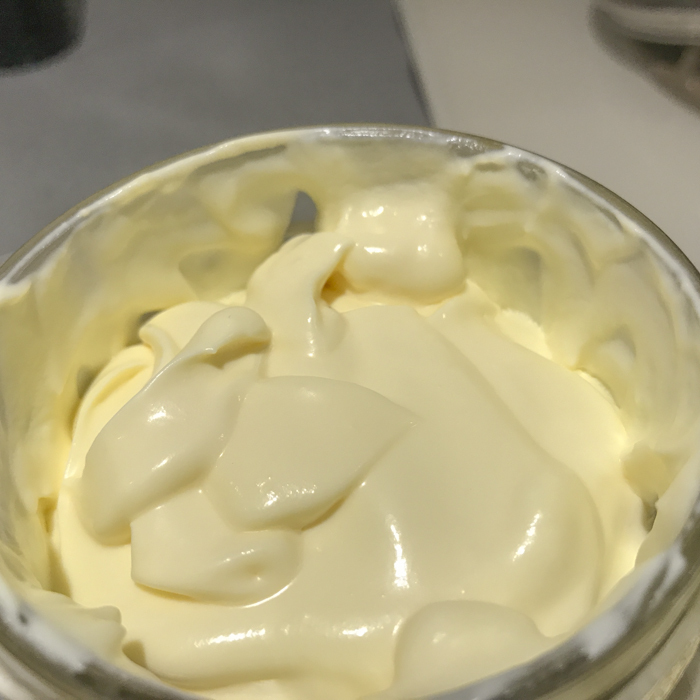 Crème Fraîche is thick, rich and used much like sour cream. The flavor is tangier than whipped cream, but milder than sour cream. It makes a delicious topping for soups, main dishes and especially desserts. Most milks have more butterfat than needed for the cheese that's being made. This is especially true for longer aged cheese like Parma, and many other Alpine style cheeses. This excess fat is removed from the milk either by skimming or mechanical extraction. In Parma, the cream is taken from the evening milk. 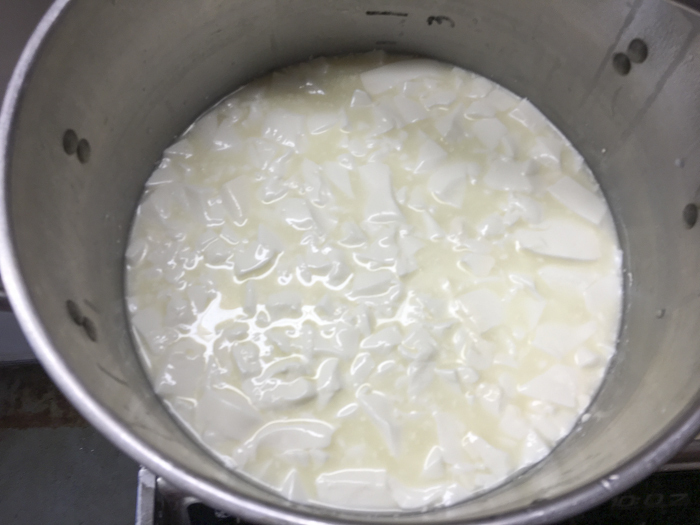 The is done by allowing the cream to rise in shallow pans and then the lower fat milk is run off from underneath and is then mixed with morning milk. 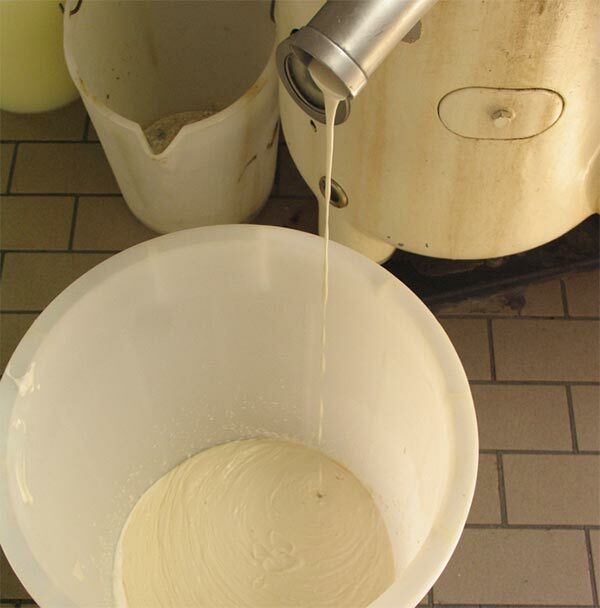 After cheese making, the whey is usually run through a separator to extract any additional cream. The whey is then fed to the Fat Parma Pigs and the excess cream here is often turned into Butter. 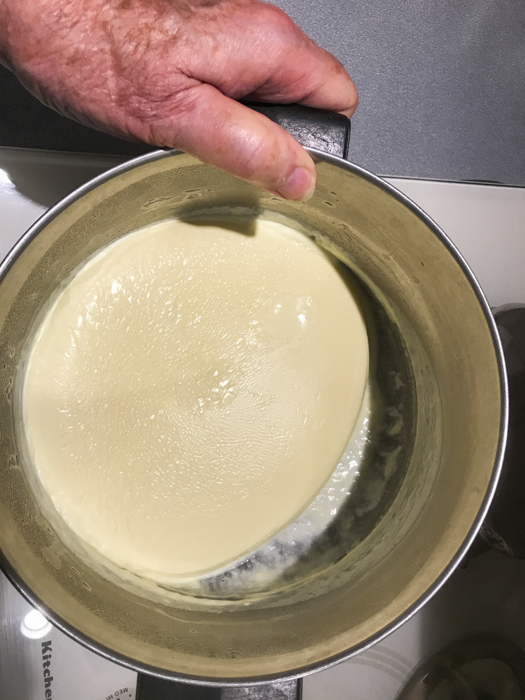 My first introduction to the versatility of Crème Fraîche was in the Alps of Switzerland, while visiting a family for a few days on the mountain making the cheese called Etivaz. 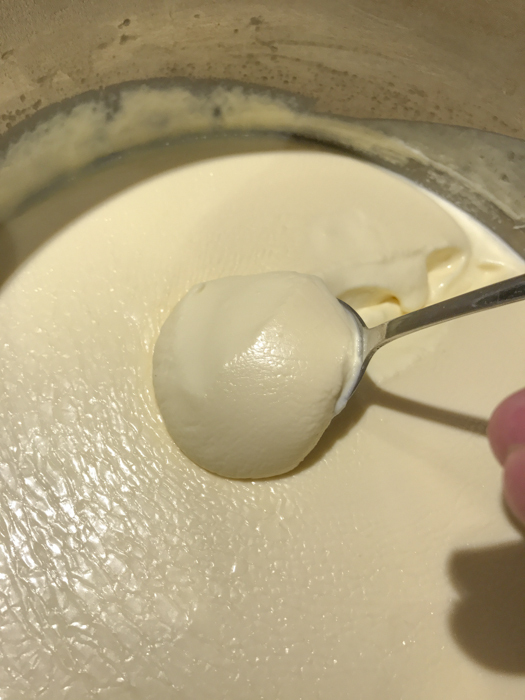 Every night they would milk the cows and let the cream rise overnight to ripen with the natural flora, then next morning they would skim and collect the ripened cream (Crème Fraîche) a then place it into a beautiful wooden bucket (with its own carved wooden spoon) that was ever-present on the table. The evening milk is allowed to sit overnight while the cream ripens and rises. In the morning it is collected for use by the family. This went into everything including coffee, desserts, soups, sauces and yes, the family enjoyed it all right there on the mountain. We were invited to stay for Sunday dinner (lunchtime on the mountain). It was "Mac & Cheese" with, you guessed it, Crème Fraîche. I have never tasted better! Dessert was poached pears with chocolate, and of course, topped with Crème Fraîche. 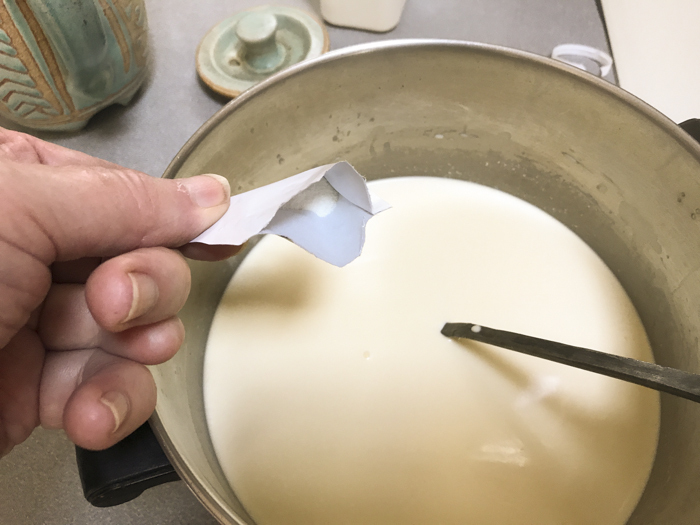 When I have seen this made on the mountains, it has simply been the cream rising on the evening milk, and skimmed about 12 hours later, before adding morning full cream milk to the skimmed milk for cheese making. 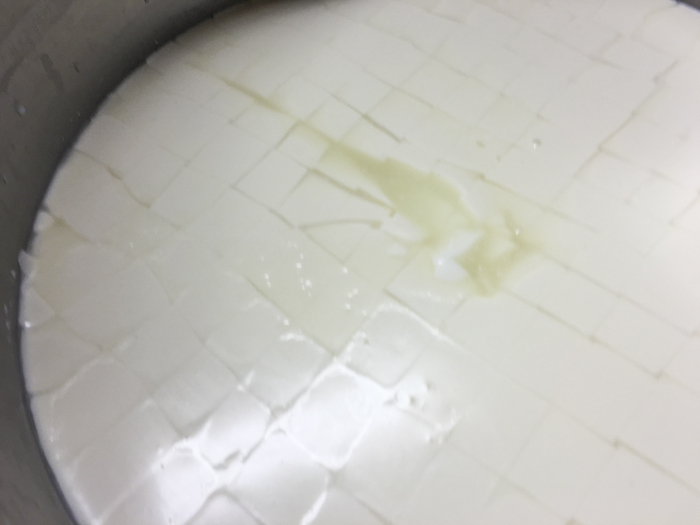 No starter or rennet was added, but be aware that you may get a different team of bacteria if relying on your own raw milk, and surprises may await.